Thank you for inviting me to blog with you today, Lovey Dovey Books! 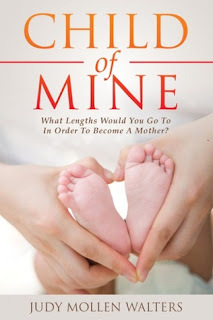 My book is Child of Mine, the story of an infertile midwife, Katie, who, adopted at birth and longing for own children, decides to search for her biological parents. I wrote this story because I struggled with infertility before conceiving my two daughters, who are now eighteen and fifteen. I still remember the feelings I had as I went through treatment; the constant blood tests and ultrasounds, the smell of the doctor’s office, the long waits between procedures and the day I would be tested for pregnancy. I wanted to capture the heartache of infertility and, of course, create an exciting story full of twists and turns for my readers. Katie wasn’t always a midwife. Originally, she was the producer of a television talk show, much like Oprah’s. I didn’t know a lot about television production, but I thought I knew enough. I was wrong! And I didn’t happen to know anyone who was in television production, so I couldn’t get a “birds-eye” view of the profession. Making Katie a television producer wasn’t working well and I stewed for a long time about how I was going to make her “feel real,” right down to her chosen profession. That’s when I got the midwife idea. I’ve always been fascinated by all things pregnancy and birth – I’m one of those women who obsessively watches birth shows, and I love hearing other people’s birth stories. When I transformed Katie from a frazzled television producer trying to keep her show afloat to a kind and dedicated midwife who was helping other women deliver their babies while she couldn’t have her own, I felt a click, and the story flew from there. Katie also has the added issue of being an adoptee, herself. Growing up, I had a friend, H, who was adopted, and we reconnected on Facebook a few years ago. H finally met her birth mother only two years before the woman died from cancer. She also discovered that her adoptive parents hadn’t been quite forthright with what they knew about her birth mother, who was not living all that far from where they had raised H. My friend has three biological children now, and when I asked her how she would have felt if she hadn’t been able to have them, given her history, she had said she wouldn’t have been able to live. That got me wondering – what if Katie were not only a midwife, but also adopted? How does it feel to be an adoptee with no biological ties at all? And that gave my storyline even more meaning. 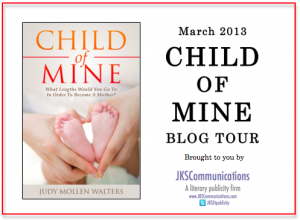 I’m really excited about Child of Mine being published. It can be purchased at Kindle, Nook, or most other online etailers. I hope people will read it and feel free to share their thoughts about it with me. I can be reached at judymwalters@gmail.com. What lengths would you go to in order to become a mother? Midwife Katie Cohen-Langer delivers babies for a living, but despite years of intensive infertility treatments and growing desperation, she can't have her own child. As families grow under Katie's careful watch, her husband wants to move on to adoption. But Katie, who was adopted as a newborn, can't bear the thought of never having a biological connection to anyone. What she discovers about her roots --and about the parents who adopted her -- rocks her world in a way she never could have expected. And even as she deals with what she finds, she still needs to figure out a way to become a mother. After many years working as an editor in non-fiction publishing, Judy became a Stay-at-Home Mother to her two girls, conceived via infertility treatment. She wrote Child of Mine as an homage to the struggle nearly 1 in 6 couples go through in order to have their families.